My annual tour of California’s Central Coast took me north, starting in Santa Barbara County up to Paso Robles, then on to the Santa Lucia Highlands and lastly to the Santa Cruz Mountains. I tasted a wide range of wines, many of them excellent and some of them flat-out great. The wines of the Central Coast remain exceedingly fairly priced vis-à-vis their peers throughout the world. In particular, I continue to be impressed with the quality of Syrah in California. I know, it’s a broken record. Wine lovers seem to recognize the quality of Syrah, but the broader market struggles to accept the wines. The most common reason I hear for this phenomenon is that Syrah is made in a multitude of styles and the public doesn’t have enough reference points from Europe to put all of those styles into the proper context. That might be the case, but savvy consumers will want to take advantage of the fabulous pricing that exists in this economically depressed part of the wine market. Once again, this year I have divided my Central Coast article into four major sections that highlight the best of Santa Barbara, Paso Robles, Santa Lucia Highlands and Santa Cruz Mountains. Wineries whose ranges span more than one appellation are listed where they are based. The Santa Cruz Mountains is its own appellation and is technically not a part of the Central Coast, but from a practical point of view, it is easiest for me to visit those wineries at the same time, hence their inclusion here. I tasted the wines in this article between late May and mid-June, 2012. 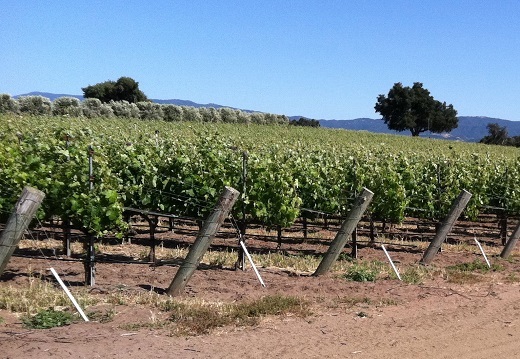 I was thrilled with the wines I tasted in Santa Barbara this year. These largely cool-climate sites continue to produce some of this country’s most distinctive wines. Most of the wines I tasted were 2010s, from a tricky vintage with plenty of ups and downs. The most successful varieties are Syrah and Chardonnay, while Pinot Noir is much less consistent, even if the best wines are striking in their beauty. Overall, 2010 was a very cold year, the coldest most growers had seen until 2011. The defining moment of the year was a brutal heat spike in late September. There had been an earlier spike in August, but it was relatively harmless as the high temperatures passed quickly. The September event would turn out to leave a huge thumbprint on the vintage. Throughout the summer, the cold, wet weather caused growers to worry that the fruit would never ripen. Some growers were aggressive in leaf-thinning, which they saw as their only hope to fully ripen the fruit. Cold weather persisted for most of the summer. In late September, the forecast called for a brief and moderate increase in temperature. What followed was a huge surge that lasted several days. The weather was especially damaging for Pinot, as the September spikes took place in the middle of the harvest, and any remaining fruit was just days away from being picked. Syrah, which was much further behind in its development, did not suffer nearly as much. Overall, the wines are lower in alcohol and higher in acidity than normal, but they are still often quite rich and offer plenty of depth. The best Syrahs are drop-dead gorgeous, while the finest Pinots are just as exciting, perhaps even more so, but with far greater variability. I tasted a number of fabulous Chardonnays as well. Readers need to be careful in choosing, but there is a lot to like in 2010. Today it looks like 2011 will be another vintage characterized by a wide disparity of quality. The year started with a violent spring frost that lowered yields dramatically in some spots. It was a cold year from start to finish, with no heat spikes and very little warmth at all. The 2011s are once again lower in alcohol and higher in adicity than normal, but in contrast to the 2010s, they also have more modest depth and structure. Right now I give the edge to Pinot over Syrah among the reds. I tasted a number of 2011 Chardonnays that are absolutely delicious. This year I came away with the distinct impression that Paso Robles is at an inflection point. That is only natural for an area that has witnessed massive expansion and growth over the last decade. I think we are about to see a natural selection process unfold. A number of wineries continue to push the envelope and are, or will shortly become, superstars. At the other end of the spectrum, there is a lot of undistinguished wine being made in Paso. Those underperformers will have to either step up their game or become marginalized. Personally, I hope we see more of the former than the latter because, as I wrote last year, Paso Robles is one of the most exciting and dynamic wine producing regions in the world. Part of the issue is a bit of an identity crisis. What are Paso Robles wines supposed to be? As I wrote last year, Paso Robles is a huge AVA composed of smaller sub-zones that aren't formally recognized, which makes it difficult for the consumer to understand the subtleties of the region. I tasted a number of wines from vintages 2005-2007 on this trip, and the truth is that many are not aging well. In the best of cases, the wines hold, but very few fulfill one of the established prerequisites of true greatness; the ability to improve in bottle. I am sure winemakers know that, which is one of the reasons there is so much experimentation going on. One of the unique qualities of Paso Robles is that Mother Nature is very generous. Maybe too generous. Achieving ripeness and richness is not a challenge. Finding an element of balance is much more elusive. The region’s top winemakers – growers like Justin Smith at Saxum, Eric Jensen at Booker, Matt Trevisan at Linne Calodo, to name just a few – continue to experiment with the use of whole clusters and cement tanks, two of just many avenues that seem to allow for greater varietal expression without robbing the wines of their inherent richness. I am less sure about fermenting small lots in oak, which just seems to give the fruit more of what it already has. There is no denying the best Paso wines are viscerally thrilling. They are that, and so much more. At the same time, it is also quite evident that the region is going through an adolescent phase as the region’s top producers settle in on a mature approach to farming and winemaking. Those growers who have the intellectual honesty to ask questions and continually strive towards excellence are making phenomenal wines that deserve serious attention. Most of the wines I tasted on this trip were 2010s. Interestingly, the heat spikes that were such a problem in other parts of the Central Coast were much less of an issue in Paso Robles, probably because most of the main varieties ripen on the late side. Growers described 2010 as a year with cold weather and a very long maturation cycle. Most producers told me they eventually achieved their desired levels of ripeness, but getting there took a lot longer than normal. I find much to admire in the 2010s. They are maybe a bit less immediate than the 2009s, but they have striking aromatics and fabulous persistence. I also tasted a number of 2011s, which turned out to be an even colder year than 2010, but with nothing approaching a heat spike. The spring frost was an issue for some properties, where yields were adversely affected, in a few spots dramatically. Whereas the grapes reached full maturity in 2010, that was not the case in 2011, at least by Paso standards. On average, the wines have a percent less alcohol, correspondingly higher acidities and medium-bodied personalities. Quality is a bit inconsistent, yet I also tasted a number of highly promising wines. It will be interesting to follow the development of the wines over the next year and beyond. I found a lot to like in the 2010 Pinots from the Santa Lucia Highlands. The wines have excellent definition, lovely fruit and terrific overall balance, although they are less opulent and fruit- driven than normal. I was less impressed with the 2010 Syrahs, many of which come across as not fully developed in terms of their aromas, flavors and overall concentration. It’s almost as if the season finished before the fruit fully ripened. Today, my impression is that 2010 is very much a Pinot vintage in this part of the Central Coast. The August and September heat spikes that were such an issue in other parts of the state seems to have been less dramatic and shorter in this stretch of hillside vineyards. Vintage 2011 presented another set of challenges. It was a cooler year, without the heat spikes of 2010, but a similarly late harvest. Ripeness was achieved at lower alcohol levels than is typically the case. Because so many wines today are vineyard designates, the ultimate factor that is most likely to determine the quality of the vintage is the extent to which growers are willing to be highly selective in terms of the juice they bottle under their top labels. Overall, the 2011 Pinots are a notch below the 2010s. There is no doubt in my mind the Santa Cruz Mountains is the greatest and most overlooked terroir in the United States. Period. Actually, it is probably more accurate to distinguish between the eastern and western part of a mountain range divided by the San Andreas Fault. While quite different in terms of the characteristics, both parts of the mountains are capable of world-class wines. From the famed Bordeaux influenced reds produced at Ridge and other nearby estates to the extraordinary, age worthy Chardonnays and Pinots of Mount Eden, to the younger wineries like Rhys, Varner and Big Basin, there is no doubt in my mind the Santa Cruz Mountains is the single most exciting place to visit in California. No other region offers the same mix of history, innovation and what appears to be virtually unlimited potential. To be sure, these hillside sites are capricious and hard to work with. But they are also capable of producing riveting, emotional, world-class wines. The level of diversity within the Santa Cruz Mountains makes it difficult to make generalizations about vintage, but my impression based on conversations with the growers I visited is that 2010 was a cold vintage with late harvest (as it was pretty much everywhere), but that the heat spikes were much less pronounced than in other parts of the state.